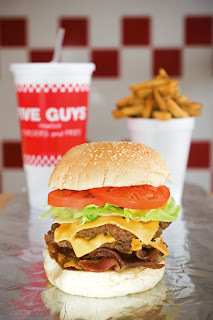 I wanna give you a rundown of some 5 Guys Facts, courtesy their website. Five Guys is a tasty burger establishment, while at the same time being as heart-health conscious as possible. They make sure there is absolutely 0% trans fat in their meals. Their delicious french fries are cooked in peanut oil to this purpose. They use only the freshest vegetables, and have used over 34 millions pounds of potatoes since they went in to business in 2008. That's a lot of fries! Now don't get me wrong about the healthy food here..., a bacon cheeseburger from Five Guys still packs a walloping 62g of fat. Not to mention over 900 of your daily calories. Who cares though? It's delicious! You know what else is delicious? FREE TOPPINGS. That's right, at every Five Guys the toppings are free! All burgers are made my hand in each restaurant and their breads are baked fresh at local bakeries. If you've ever been to a Five Guys you know that while you're waiting on your made to order burger, they have an endless supply of peanuts for you to gnash on and then discard on the floor. I always love a restaurant that lets me throw my peanut shells on the floor. It's so liberating! Like most big guys, I love a good cheeseburger, and for me it's gotta be Five Guys... otherwise I'd just cheating myself. I don't know what it is, but I think it's the combination of fresh toppings, fresh bread, handmade and then grilled burgers, crisp apple smoked bacon... what more could you ask for on a burger? What about you readers? Is Five Guys the bees knees for you too, or is there somewhere else you like? How do you feel about In and Out burgers? Also, I'd probably be writing a different article if there was a local Backyard Burger, but until then, I'm sticking with Five Guys. If I'm in an area that has a In n Out near by I'd defiantly choose it over most fast-food chains. The difference is I will drive 45 minutes every other weekend to get my hands on a Five Guys burger. This blog started off promising, but it seems to follow the pattern now expected from bloggers of the "jerks" reputation. I know you fat dudes are eating out ( and by that I mean prepare food at restaurants, certainly not pleasuring females)2 or 3 times a day, at least- you probably get the 4th meal as well. So where are the updates? You guys are decent writers and good videographers and sometimes entertaining. I dont expect a post every day, but you would think at least a couple days a week. I know sometimes you spend so much time eating you dont have time to write but give it a try. This blog is a fun project for us. We don't make any money off of it or anything, so it's not like we have deadlines. Yes, it doesn't take much time to stop and post - I actually started to today but then didn't. I've been sick for the last week... and I know a couple of our other writers have also had a lot going on lately. So that's all it is... we're just busy/unavailable. We'll be posting though, so thanks for sticking with us! How is this blog just a "fun project" and "not for money" when there are ads on it? YOU'RE A LIAR! Anonymous, as you will notice, the person that commented and said that this is just for fun and not to try to make any money, no longer writes on this blog. He IS liar. We want money, keep reading, thanks!